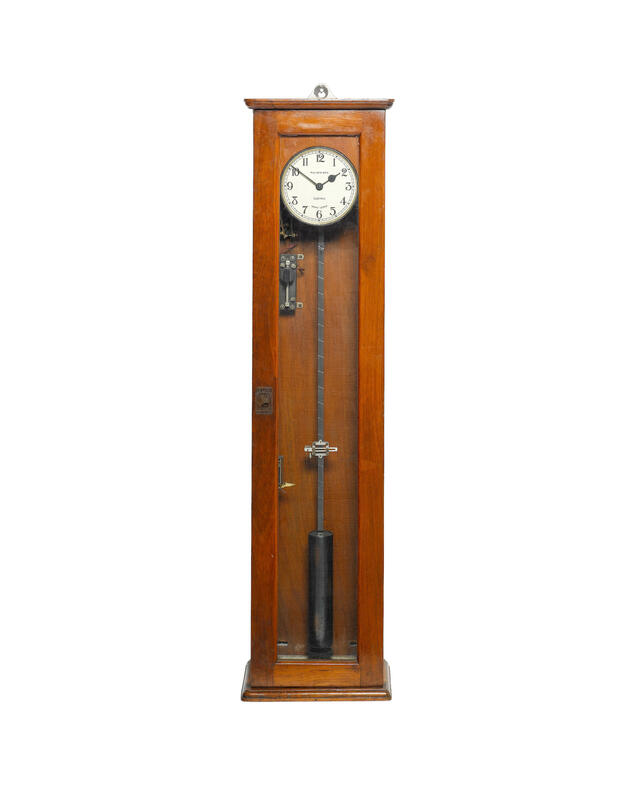 A mahogany Pulsynetic C-7 electromagnetic pendulum master clock, Gents, Leicester, circa 1927 The movement with green painted cast-iron bed inscribed in relief THE B-P PATENT SYSTEM over PAT NOS 24620/04 & 919/07 with integral cast wide-jaw suspension for the steel-rod seconds pendulum with cylindrical green painted bob over brass pivot for the crutch assembly incorporating shunt for the escapement and switch armature for the electromagnetic coils positioned to the left of the mechanism, the right hand side with the Hipp-toggle escapewheel pivoted between shaped brass plates, the whole applied to the case backboard along with rheostat and other electrical components within box surround with hinged arch-glazed front incorporating slave dial with brass electromagnetic coil driven mechanism, the exterior with ogee cornice over 6.5 inch circular silvered Arabic numeral dial inscribed PULSYNETIC, GENT & CO. LTD., LEICESTER, ELECTRIC. to centre and with blued steel hands, the lower rail of the glazed front door with ivorine button inscribed PULSYNETIC, PATENT NOS 24620/04 & 919/07, TIME TRANSMITTER over moulded skirt, the upper internal rail of the case stamped with serial number 1595 and the upper left hand side pasted with an original paper label relating to the transmitter incorporating indistinct date 28-2-27 in ink, 103cm (52.5ins) high. 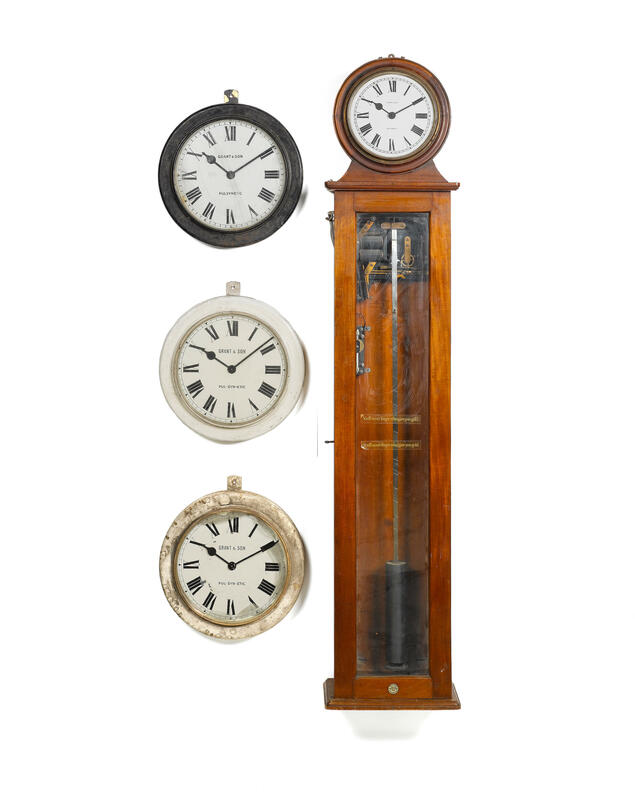 Gents of Leicester were founded by John Thomas Gent in 1872 and specialised in producing electric timepieces principally for semi-public and industrial use alongside fire alarm systems, telephones, transformers and related products. The firm initially operated from Faraday Road, Leicester, later (after WWII) moving to nearby Kibworth. They were bought-out by the multi-national organisation, Chloride, in 1981. The current lot appears to be a rare variant in that it incorporates an integral extension to the lower right hand of the bed casting to take an additional accessory.